It requires wads of cash, but this snare is a genuine work of one-off art, as well as a fantastic drum. True one-off. Interesting tones. Conversation starter! Here we have a 14"x51⁄2" snare created from an F4 Phantom fighter jet. The drum is sand cast aluminium with 2.3mm triple-flanged hoops and rounded bearing edges. It also features a lathed shell and 10 chrome tube lugs. "Provenance has also made drums from a 1966 Jaguar MKII, a 1962 Bentley S2 and a 1962 Rolls Royce"
"I have a fascination with history, historical artifacts and classic design, as well as a passion for music, drums and drumming. In particular I love British aviation, automobile and maritime objects. After visiting an aviation museum, I thought it would be a cool thing to make a snare from a Spitfire. The idea grew from that to what Provenance is today." But is it all a gimmick? Style over substance, perhaps? The answer is a resounding 'no'. It doesn't take long for us to realise how special this drum really is. This 14"x51⁄2" snare is something more of a muscle stretcher. Well, they don't make those fighter jets out of any old material, you know - and that sturdy Dunnett R Class doesn't help lighten the load. "A few turns of the drum key and it soon bursts into life with an explosion of sound"
A 5B to the middle of the drum draws somewhat surprising results. It sounds somewhat dead on first impression, bellowing out an ungodly, boomy thud, like a cricket bat to the side of the head. A few turns of the drum key and it soon bursts into life with an explosion of sound, as we find more of a deep growl with a hint of metallic overtone. Cranking the snare to its limits brings a whip-like crack that gets a big thumbs-up from the rest of the band. Sonically, it's not a million miles away from the EcHo Custom Drums aluminium snares that we reviewed back in May. The drum's tonal capabilities aren't quite as wide-ranging as those found with the recently reviewed Provenance piccolo, but the 14"x51⁄2" remains a solid performer which also packs plenty of body - you can get a satisfyingly full, fat sound jam-packed with resonance. While the drum is made from metal, there's not a single hint of clang to its sound, instead it's more than capable of a beautifully clear tone, and both kick out a hell of a racket when required. Of course, this drum is eye-wateringly expensive. 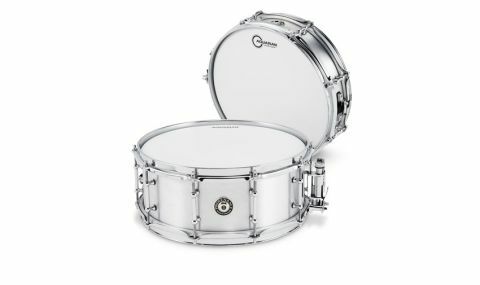 £1,000-plus for a snare drum is monumentally pricey, but then we must remember that something being expensive doesn't necessarily equate to poor value for money.